«Volume» is a machine, the function of which is to become increasingly loud over defined period of time of about an hour. This volume development can be interrupted at any time by turning the large knob on the front in order to turn the volume down. Following such a possible volume control, the noise once again increases with the same speed until it is once again turned down… – a continuous repetition. This object activates at precisely the pre-determined opening hours of the exhibition, an automatic process – there is no on or off button. Equipped with a backup power supply for several days and constructed from massive steel plates, this object offers hardly any possibility for escape within the exhibition space. 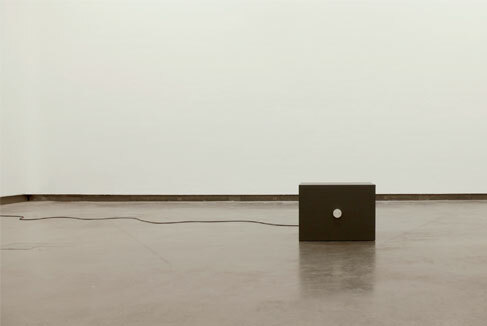 «Volume» is an installation occupied with the balance of power that develops between machine and humans. It is the attempt to draw into the exhibition space the nearly invisible moment of machine service. This installation requires a caretaker as a necessary component. It is addressed towards the supervision of an exhibition space, which is present due to a defined employment relationship.